Want to live longer and be happier? Want to be thinner and keep your muscle tone? This isn’t a space-age weight loss gimmick or designer weight loss drug. It’s metabolic ketosis. In a nutshell, ketosis blunts your appetite with satisfying meals. While in ketosis, you’ll rapidly lose more body fat and keep muscle mass. Ketosis stabilizes neurons, increases your mood and heightens your mental focus. You’ll feel happier, more energized. Ketosis also lowers LDL cholesterol, promotes cardiovascular health and treats diseases such as type 2 diabetes, hypertension, Alzheimer’s and various cancers. Ketosis meals are a little different from your usual, low carb plate. Say hello to more fat and fiber. You’ll explore new, healthy sources of fat such as organic grass-fed butter, almond oil, flax, olive oil, avocado oil, coconut oil and MCT oil. When you cut the carbs, you also cut the crunch. Fat is creamy, so adding texture is important. Bring back the crunch with bacon, or try something unexpected using exotic high fiber, low carb veggies. Carrington Farms Organic Coconut Oil is essential for rapid fat-burning. Fats from coconut oil aren’t stored. Instead, coconut oil fats are used immediately for energy. Coconut oil can last up to two years without spoiling. Coconut oil gives food a nice “buttery” (not coconut) flavor, and is one of the healthiest choices for cooking and baking. Non-GMO, free of hydrogenated and trans fats, Kosher and organic. La Tourangelle Avocado Oil is all-natural, expeller-pressed, non-GMO and Kosher. La Tourangelle has a fruity roundness – great for both sweet and savory recipes. MCT oil is an easy way to increase your healthy fats. 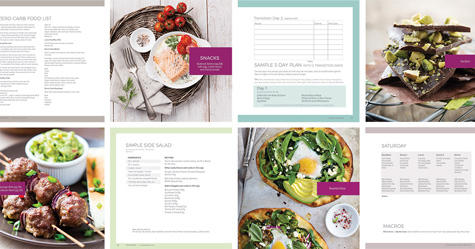 Add to salads, smoothies or your latest coffee fasting plan for immediate, all-day energy. Triple filtered, pharmaceutical grade, BPA-free container, USA-made. Fiber has no effect on insulin levels. High fiber foods are safe to eat during ketosis. Choose leafy green vegetables such as lettuce, spinach and broccoli for a super crunch. These signature keto recipes are tried-and-true low carb favorites with a healthy, fat-burning twist – MCT oil. Be creative and experiment with your own variations. The keto MCT oil meals below are around 500 calories each and 78-82% healthy fat. These meals can be eaten separately as main courses or all in one day. That’s right, eat them all – if you can. 2 net carbs for total recipe. 2.5 net carbs per serving for 2 servings. 1 net carb per serving for 2 servings. This infographic of the keto food pyramid shows the importance of each low carb food in a simple way. If in doubt, choose the safest low carb items using our complete list of over 200 ketosis foods. Click the image to view, print or save. Special test strips called keto sticks (or ketostix, keto strips) are used to detect ketones in the urine, a sure sign of ketosis. Keto sticks are a good detector of ketosis, but if the strip doesn’t register the presence of ketones, you can still be ketosis. This happens when the urine sample is diluted from drinking lots of water. It’s also possible to use up all the ketones during heavy exercise. Fat-adapted low carbers may not register ketones after being in ketosis for long periods of time. Fat-adapted low carbers use ketones more efficiently and levels may not be detectable in the urine, even though they are in ketosis. Rely mainly on your eating habits and use the strips to check in.